Forget your idea of superheroes – witty as Iron Man or muscular as Captain America – for Disney’s latest superhero is none of that. In fact, think chubby with a chance of balloons. The face of Big Hero 6, Baymax is a robot in an inflatable body that is nothing short of adorable. Set in the fictional city of San Fransokyo, Big Hero 6 centers on Hiro Hamada, a 14-year-old prodigy in robotics. Despite his talents, he creates a nifty robot and spends time battling it out at underground robot fights. On the other hand, his older brother is Tadashi Hamada, a science geek at the San Fransokyo Institute of Technology. He developed Baymax for his science project, a creation intended to be a healthcare robot. In an attempt to pull Hiro into studying, Tadashi brings him into his robotics lab and introduces his close friends, a bunch of science students with their specializations. Having also met their professor whom he looks up to, Hiro is inspired and wants in. At a science fair in recognition of the best in robotics that is open to all, the top creation is offered a spot at the institute. Tadashi thus urges Hiro to join it and persuades him to make something, which he does eventually. A healthcare robot, Baymax has functions nothing short of cool. 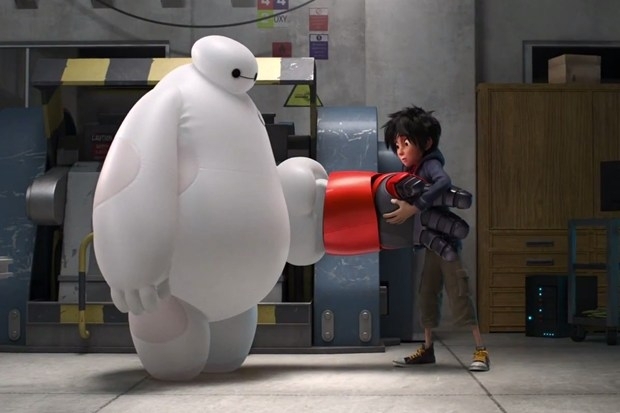 With its purpose to heal, much like a First-Aid kit, Baymax comes bundled with scientific analysis. It gives a diagnosis of its “patients” followed by recommended treatment measures. The only trait it lacks is the ability to differentiate between physical and emotional pain. Otherwise, what makes it amusing is the neutral tone that corresponds with its formal questions. The dialogue between Hiro and Baymax forms much of the humour, which also makes for the emotional moments. Due attention is paid to the accuracy of the medical terms it conveys, while at the same time it is made to be understandable for kids. As an inflatable robot, Baymax is prone to sharp objects and a limited battery life, which makes for even more comedy. And with only 2 black spots as its eyes, one can’t help but laugh whenever it speaks. Directors Don Hall and Chris Williams weave a simple storyline peppered with humour that entertains throughout. Its minor loopholes can be easily forgiven and the plot twist is worth the storyline. As a viewing experience, 3D is not a must to fully enjoy this animated brilliance. As far as Disney movies go, Big Hero 6 is the latest production that is worth a watch. It is also poised to be the best of animated movies in 2014. Targeted at families, children will squeal at the cuteness of Baymax while young adults will be touched by the story of Baymax. Big Hero 6 opens in theatres 13 November 2014.